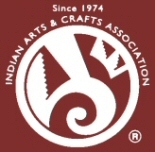 If you have 'Kingman Turquoise Heart Pendant by Navajo Artist Artie Yellowhorse' in your shopping cart go to View Cart at the top of the page to check out. If you are having any problems with the checkout process we are here to help. Call us toll free 1-877-892-0297 to place your order. 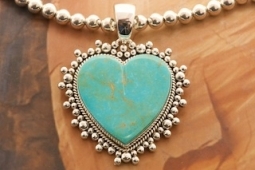 Genuine High Grade Kingman Turquoise set in Sterling Silver Heart Pendant, on an 20" 7mm Sterling Silver Bead Necklace. Created by Navajo Artist Artie Yellowhorse. Signed by the artist. The Mineral Park Mine, in the Cerbat Mountains 14 miles northwest of Kingman, was first mined by Indians centuries before white man came to the area. It is one of the three sites of prehistoric mining localities in the state of Arizona. Mineral Park was the most extensively worked area by the Indians of the three. S.A. "Chuck" Colbaugh found a cache of stone hammers uncovered in ancient trenches and tunnels, when he had the turquoise mining concession in May of 1962. Ithaca Peak and Turquoise Mine (formally called Aztec Mountain or Aztec Peak) are the most famous of the peaks in the area containing turquoise. Pendant is 2 3/4" L including bale x 2" W.